Poach chicken thigh ahead of time. Combine 3 skinless chicken thighs, 1 peeled garlic clove, 2 bay leaves, 2 teaspoons kosher salt, and 10 peppercorns in a medium pot, cover with cold water, and simmer until chicken thighs are cooked through. When the thighs are cool enough to handle, shred the meat. Set aside for assembly. In a small skillet over medium heat, place the ancho chilies in a single layer. Cook about 4 minutes per side to get crispy and fragrant. Put chiles to a medium metal bowl. Pour boiling water over chiles to completely cover them and soak at least 10 minutes until they are soft. Drain water from chiles. Add them to the bowl of a blender or food processor along with the serrano chiles, tomatoes, ¾ of the diced onion, and about 1 cup of the chopped cilantro. Add chicken broth and salt. Blend until smooth. Over medium-high heat, heat oil in a large cast iron skillet until it reaches 350°F. Fry tortillas in batches until they are crisp and have stopped furiously bubbling, about 1 minute per batch. Remove with a slotted spoon to a paper-towel-lined baking sheet and sprinkle with salt. Strain oil into a heatproof container. Wipe out the pan and return it to the stove over medium-high heat. Add ¼ cup of the used oil, discarding the rest. When it is shimmering, carefully pour in blended chile mixture (it will bubble furiously) and fry it, stirring often, until it is fragrant and no longer raw-tasting, about 7 minutes. Reduce heat to medium low, then stir in lime juice. Adjust seasoning with salt, if necessary. Add fried tortillas, stirring gently until they are softened and well-coated with sauce. 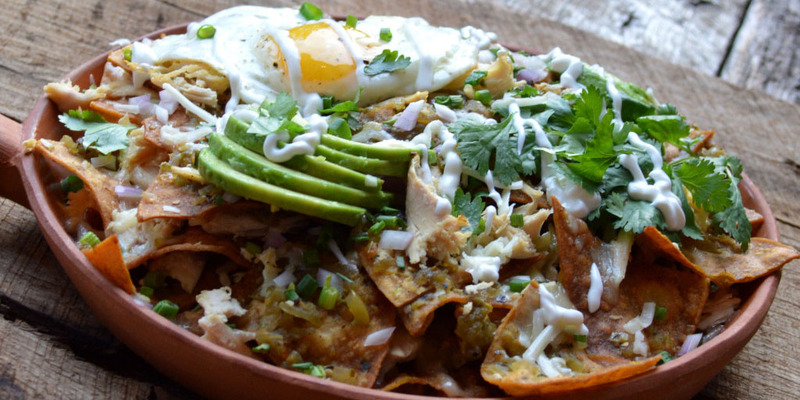 Transfer chilaquiles to four individual serving plates. Wipe out the skillet and add the butter. Cook the eggs to your preference – fried or scrambled. Fried, sunny-side up will be the most impressive looking. When done, add on top of the chilaquiles. Now, place on top the shredded chicken, cheese, a drizzling of the crème fraîche, radishes, avocado, cilantro, and remaining diced onion.